Fantastic Negrito is—as his bio eloquently states—the incarnation and brilliant invention of Xavier Amin Dphrepaulezz, born in 1968, the eighth child of a Somali-Caribbean immigrant and today on the brink of becoming a superstar. Dphrepaulezz grew up in Oakland, California and quickly took to a life of "bullshitting and hustling." To celebrate the release of the new Ltd. Ed. Peter Frampton Les Paul Custom PRO and Ltd. Ed. 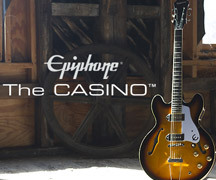 Peter Frampton "1964" Texan Premium Outfits, Epiphone.com spoke with GRAMMY winner and Musician's Hall of Fame member Peter Frampton. Epiphone.com continues our on-going conversation with Ohio native and East Nashville music hero Aaron Lee Tasjan who is celebrating the release of his new album, Karma for Cheap, which rocks, pops, and folks with his trademark confident manner, sparkling guitar lines, and inspired songwriting. Fifty years ago on January 30, 1969, The Beatles held their last public concert on the rooftop of Apple Records, the London headquarters of their new record label, film company, and recording studio.